(TB2YA5E) Todie's Wild Ride Geocoin - Todie's Wild Ride II: Put on your Brain Bucket! Todie's Wild Ride II: Put on your Brain Bucket! Use TB2YA5E to reference this item. The mission of this coin is to travel the world to remind cyclists and bikers (and rockclimbers, skateboarders, rollerbladers, etc) to wear a helmet. Never ride without your brain bucket... you never know when an accident could occur, and a helmet could save your life. Hopefully you'll never need your helmet--but if you do, it will be on your head where it belongs! Here are some tips to help you get the most of your helmet. 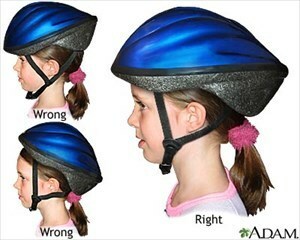 These tips are primarily for cyclists, but the principles apply to most sport helmets. Be sure your helmet is approved for use in your particular sport or activity. Wear your helmet properly, with all straps and buckles fastened. Don't wear your ballcap under your helmet. Store your helmet out of the heat. If your helmet is in a crash, you should buy a new one. Buy a new helmet every three years. Make sure your helmet is the right size. Wear your helmet EVERY time you ride. Gallery Images related to Todie's Wild Ride II: Put on your Brain Bucket! Didn't see any trackables in here. Good hide. TFTC. Cool coin. Going to take this to Alaska with me in 2 weeks and drop it off there. In order to maximize wildness, your brain should be running on nitro-caffeine. Mr. Todie looks like quite the character. Will be sure to place somewhere even more wild than bobcat poop if that's possible.